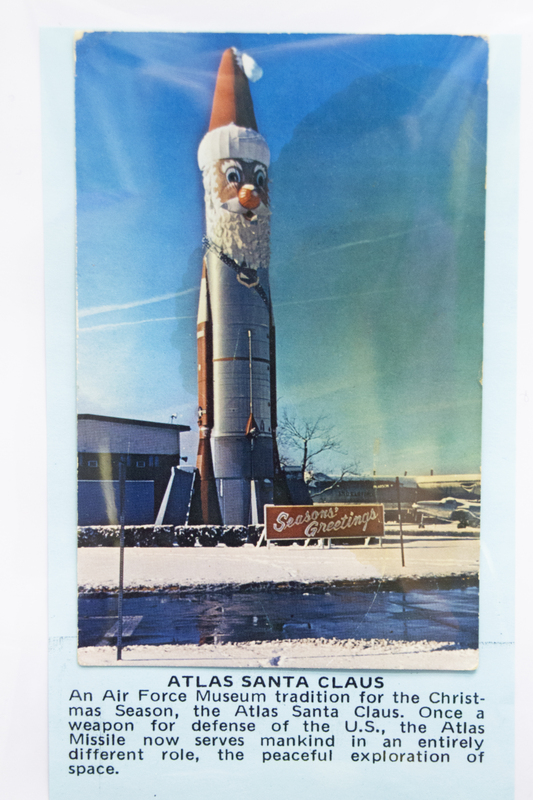 Card #4 Atlas Santa Claus shows an old photograph of an Atlas rocket decorated like Santa Claus for Christmas, with the description: “An Air Force Museum tradition for the Christmas Season, the Atlas Santa Claus. Once a weapon for defense of the U.S., the Atlas Missile now serves mankind in an entirely different role, the peaceful exploration of space.” I am guessing that this picture was taken in the 1970s at the Air Force Museum in Dayton, Ohio. On display at Christmas at the Air Force Space and Missile Museum, Cape Canaveral Air Force Station, Florida.